I can’t believe it’s been so long since I’ve posted on this blog. So much going on, what with The Judy Room website, the official Liza site, other web and print design work, plus my normal 40+ hour per week job! Whew! But “it’s all good” as they say. There is much on the horizon…. The 70th anniversary of THE WIZARD OF OZ is in 2009. Warner Home Video has already released a logo that has been circulating around the web (see right). I think it first appeared at the big “Ruby Slippers” kick off to New York’s Fashion Week on September 4th. Now there are 70th anniversary stamps and calendars and even Madame Alexander dolls for McDonald’s Happy Meals. What fun! Of course, the film is getting its Blu-Ray debut next year. Plus there will be a new standard DVD edition, this time with FOUR discs! The film was given the “Ultra Resolution Process” restoration back in 2005, and released in 3-disc and 2-disc DVD editions. I can’t imagine what they would do to add an additional disc to the set. The 3-disc version was the “ultimate” DVD collector’s edition. Tons of great extras. It’ll be interesting to see what they do, and how they do it. I’m sure it’ll be fantastic. Regardless of some of their “lax of late” DVD releases, Warner Home Video always does the biggies like OZ right. So get ready to go out and shell out even more money for yet another home video incarnation of our favorite film fantasy! THE OTHER BIG NEWS of this year is the announced “6k” restoration of A STAR IS BORN (pdf). I think we’re all anticipating this release. Out of nowhere Warner Home Video announced that they were giving STAR their first “6k” restoration. Previously, most restorations have been at a “4k” maximum resolution (for HD). As I’ve stated over at The Judy Room news page, and also on The Judy Garland Message Board, I THINK that more (if not all) of the remaining missing footage has been found. I know a lot of people have said that if that were the case, they’d be shouting it from the mountain tops. Not necessarily. They could wait until the restoration is done and then make one big announcement about the restoration, the missing footage, and the new DVDs. Why do I think this? Back in 1999, when STAR had it’s only DVD release, a VP at Warner Home Video stated, off the record, that that was the last time they would restore STAR. He said the only thing that would make them revisit the film would be the discovery of the missing footage. Sooooooo, now suddenly, in a non anniversary year for the film (2009 will be the 55th anniversary – not the usual milestone), they announce this big restoration and HD/S-DVD [standard DVD) release. While they’re in the midst of preparing both OZ and GONE WITH THE WIND for their simultaneous 75th anniversary releases (again, in 2009). Why STAR? Why now? There must be some particular reason or event driving it. It’s extremely expensive to do these 6k restorations. And let’s face it, STAR doesn’t have the same market value as OZ or GWTW. Much as us Garland/STAR fans like to think so. But the general public doesn’t get as thrilled about a 6k restoration of STAR as we would. It’s a very limited return on such a big investment. While OZ and GWTW will live on the shelves for a long time in HD/SDVD. I hope I’m right! If I’m not – that’s ok! We’ll get a great new, and better looking, STAR so it’s a win-win situation! What? Is she back from the dead? No. Nice try. 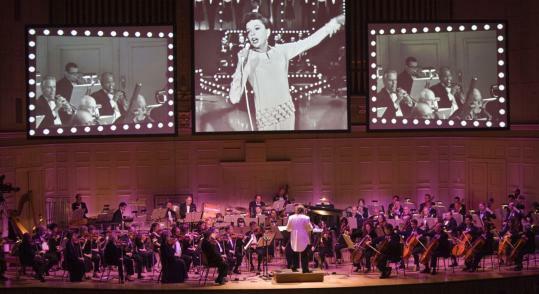 Currently playing in Salt Lake City with the Utah Symphony after a successful “opening” in Boston is the new multi-media show “Judy Garland In Concert“. The premise is fairly simple. A live orchestra accompanies Judy’s voice that has been isolated from the source elements, while the footage of her singing the songs is on a series of screens above the orchestra. It’s all to give us as close a chance as we’ll ever get to seeing Judy “live” in concert. Garland historian John Fricke was (is) the “Creative Supervisor”. According to his posts on some of the Garland discussion groups, the show is a combination of Judy’s isolated voice (“from all but 4.5 of the songs”) [from the TV series], and the “remaining” songs using Judy’s voice isolated from the Capitol multi-track recordings. In other words, he’s referencing that her voice was isolated from her TV series performances and the remaining “4.5” are from the earlier Capitol studio tracks. Which is intriguing as the TV series survives only in mono. I want to see this if it gets to San Francisco. So far the only performances have been the Boston premier and the upcoming Utah Symphony performances (this Friday and Saturday, September 26th & 27th). I want to see it because I want to experience it myself and make a final, informed opinion. UPDATE 05-22-09: A little while back, John Fricke sent me one of his “nasty grams” slamming me because someone told him that some or all or most of the technical information above (that I got from his own posts on a Yahoo Group) is incorrect. I asked him just exactly what was incorrect, and I would gladly change it. To date I have not received any corrections. So, the above technical information may not be exactly correct. I don’t know. Amazon now has available, on CD and for MP3 download, of some of the MGM “Leo Is On The Air” radio shows. These shows were specially made by MGM, pressed on 16″ discs and sent to radio stations to promote their films. For the musicals, they include pre-recording cues that pre-date the era of soundtrack records. Although not commercially available at the time, so many were made and sent out that many still survive. Included in this first round (here’s hoping there’s more!) are two of Judys films: THE WIZARD OF OZ and LIFE BEGINS FOR ANDY HARDY. They’re basically long commercials/trailers, but the do contain some fun dialog and music snippets. “My Judy Garland Life”: A new book coming out by Susie Boyt. It looks to be an interesting read. Gary Horrocks (of “The Judy Garland Club”) has given it a big, enthusiastic two thumbs up! Click here to find out more…. 2009 will be the 10th anniversary of The Judy Room! It’s incredible to me just how much the site has grown over the years, how much it’s changed, and the journey it’s taken. There will be some new pages and sections (and new graphics too), and especially some fun “events” throughout the year. I thought about doing a complete re-design of the site, but I don’t think that’s necessary. I’d rather concentrate on fun things to celebrate this milestone. So, keep watching in 2009…..